"She started screaming and crying, and said, 'Someone just stuck their hand in the door,'" Angeles-Morales told WISH-TV. "The guy said, 'Give me the money or we take the baby.'" "The man said, 'Money, money,'" Garzon-Jimenez said. "I said, 'I don't have any.'" "But there was something else waiting for her at the back door," WISH-TV reported. 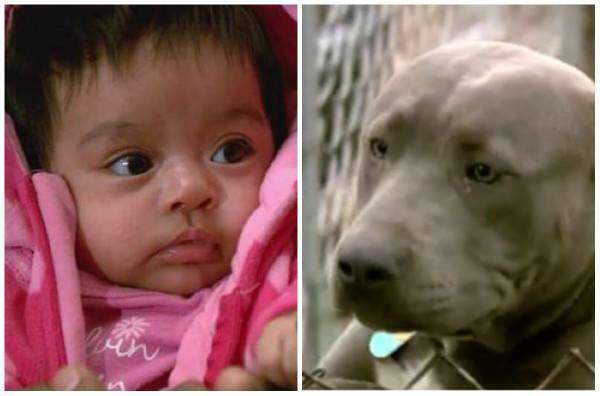 "One of the doggies," a pit bull mix, "didn't let her go through the back door," Angeles-Morales explained. The woman turned around, "threw the baby back" at Garzon-Jimenez and the perpetrators fled the scene. Indianapolis police are now searching for the suspects: "a black man around 35 years old, 6-foot-2, heavy set with light skin, a close-cut beard and acne scars" and "a black woman in her mid-20s about 5-foot-10, heavy build with braided hair pulled back in a ponytail" and "two lip piercings and an eyebrow piercing." They were driving "a 2002-2007 chocolate-brown van with tinted windows and windows that extend down the passenger side."